At present and for the past few years a large amount of existing buildings and bridges in Bulgaria have required reconstruction and renovation. This tendency poses a number of problems that have to be solved by our construction specialists. The main task is to determine the actual technical condition of the load-bearing elements and structures so as to provide a possibility for preserving and utilizing them in the future. This often includes specification of the types and description of apparent faults and damages, degree of wear of the elements, the quality of materials used and other important parameters needed even in the presence of their executive designs. 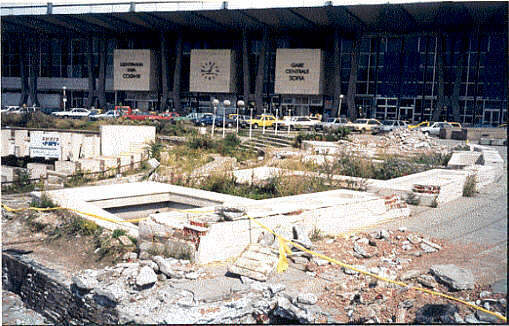 The present paper treats a complex method for assessing the condition of the Rotunda load-bearing structures in the open square in front of the Sofia Central Railway Station. This method is based on the practical application of various contemporary physical methods and apparatus for Non-Destructive Testing and Diagnostics of concrete and reinforcement in reinforced concrete elements and structures. As a result of their complex application, reliable input data have been obtained to help accelerate the design preparation and accomplish the reconstruction. The technical investigation presented was conducted in connection with the ongoing reconstruction and renovation of the open square in front of the Sofia Central Railway Station (Fig.1). Investigation and assessment of the type, extent and quantity of manifested faults and damages. Monolithic single reinforced concrete footings in which the steel columns are anchored. The so-called 'correlation coefficient' of the standard dependence - the relationship between the established surface hardness by BSS (Bulgarian State Standard) 3816-84  and the actual concrete strength in the tested elements, obtained by BSS 505-84  and BS EN 12504-1  was directly determined by breaking the test specimens cut off the elements themselves. For the purpose, a total of 7 cored specimens were cut off selected beams and slabs from the top structure in sections B and C of the Rotunda(Fig. 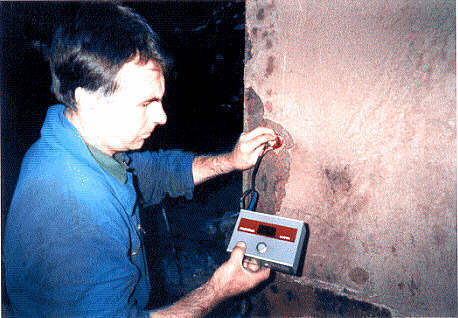 3), from places previously subjected to non-destructive testing (NDT) by a concrete test hammer. 15 cylindrical test specimens, Æ 74 mm in diameter and approx. 100 mm in height were additionally shaped from the cut off cored specimens. These specimens were tested under lab conditions for their volume density (whose average value was 2 340 kg/m3), their homogeneity (which turned out to be quite good) and the concrete compressive strength (which varied from 30 MPa to 40 MPa). NTD was performed by a concrete test hammer "Schmidt", type N34 (Fig. 4), in compliance with the standard requirements . A total of 110 spots (series), of which 95 series on radial and ring beams in sections A, B and D and 15 series on RC slabs from sections B, C and D. Single average probable concrete compressive strengths of 30 to 40-45 MPa were found with relatively low variation coefficients (0.05 - 0.10), according to which their characteristic strengths were obtained of the order of 30 to 35-36 MPa thus rating the utilized concretes in class B30 according to the existing BSS [2, 5]. 7 cross-sections of radial beams from sections A, B and D in a total of 33 measurement bases were tested by the two-sided ultrasonic method using a UNIPAN ultrasonic thickness gauge, model 543 (Fig.5), in compliance with BSS 15013-84 . The depth of carbonation of the concrete of the structural elements was determined by a chemical method by using 1% solution of phenolphthalein in alcohol as a reagent . When freshly damaged surfaces of concrete coating are moistened, the coating being carbonated and not protecting the reinforcement from corrosion efficiently, then the concrete is not colored. When treating the surface of non-carbonated concrete with the above-mentioned reagent, its surfaces are colored in crimson (Fig.6). From the testing of 14 zones of radial beams and slabs it was found that the depth of carbonation of the tested RC beams at the radial joints where continuous atmospheric water leaks occur, is of the order of 15-20 mm. 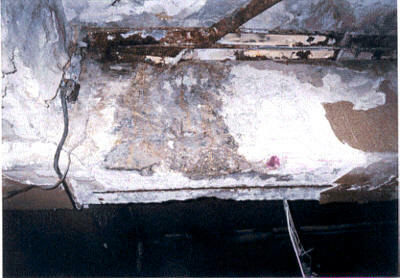 It comprises the stirrups and partly the longitudinal bearing reinforcement along which surface corrosion is established at a depth of up to 50-80mm whereas in the RC slabs and beams without leaks,failures and cracks it is from 0 to 5-6 mm and the reinforcement there is still in non-carbonated concrete. 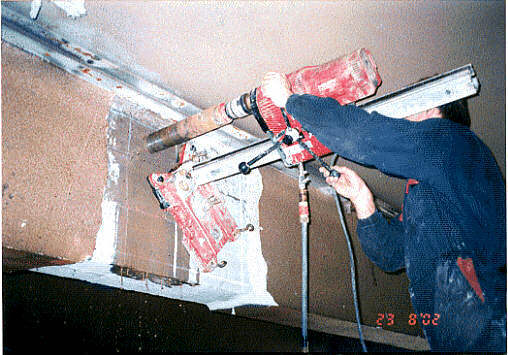 The specification of the method of reinforcing the main bearing elements was carried out by a Ferroscan FS10 scanner manufactured by the HILTI Corporation(Fig.7). Thus, more than 30 area zones of slabs and beams of RC structures, mainly from section B and partly sections A and C were tested (Fig.8). It was found that the bearing reinforcement of the RC slabs (one-way reinforced with N16 and N14 of class A-III - Figs. 13 and 14) and of the radial and ring beams (N32, class A-III) is correctly positioned and corresponds to the schemes accepted in the calculations, whereas the stirrups in them (Fig. 12 of class A-I) also correspond in number and type to the ones accepted in the calculations, but in some places have been accomplished with lateral deviation (inclined) and spacings of 10-12 cm to 25-26 cm for a design spacing of 20 cm. 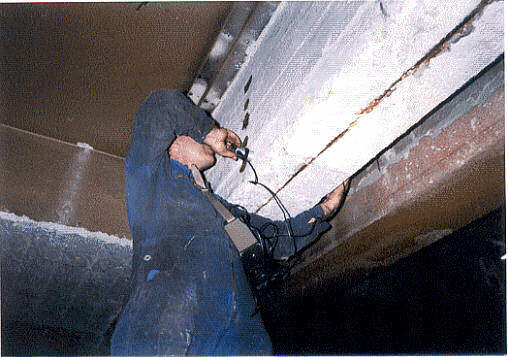 From the local additional investigations made it was found that the stirrups of the radial beams next to the joints along the inner I ring and of the beams and slabs in the leak zones occurring in fully carbonated concrete have an initial to medium degree of corrosion at a depth of 50-80mm and the longitudinal bearing reinforcement of the beams in these zones and in the established local spots with surface cracks and failures has corroded only superficially up to 5-10mm. It was performed by an ultrasonic device DM1 manufactured by KRAUTKRAMER Co., with an accuracy of 0.1 mm and a range of 100 mm. 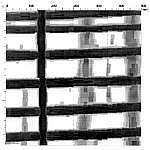 The sections under the pavement of the uncovered 6 columns were diagnosed as well as the visible part of 12 steel columns (Fig.9). From the analysis of the results it can be seen that only the thickness of the walls under the column pavement level along the inner ring 1 and of those along the radial joints along rings 1 and 2 has considerably decreased. In these wall the minimum thickness with 95% security is 17.6 mm (12% corrosion wear), whereas the overground visible parts of the walls of the same columns have corroded much less - approx. 3%. From the investigations made it was found that the monolithic RC footings under the steel columns are in a comparatively good technical condition without traces of faults or damages on the concrete surface and the NDT of the concrete in them showed that at present it has good homogeneity and can be referred to concrete class B20. 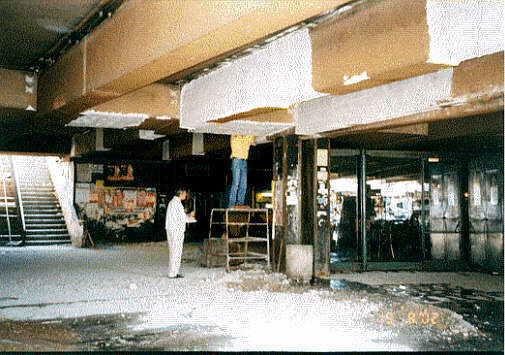 Give adequate recommendations to the designs for rehabilitation and strengthening of the individual elements and parts with established degree of wear in order to guarantee the necessary security and durability of the structures as a whole by the efficient utilization of existing bearing elements in accomplishing the reconstruction. Concrete. Non-destructive testing for determining the probable compressive strength by the surface hardness. BSS 3816-84. Concrete. Strength control and assessment. BSS 9673-84. Concrete. Pulse ultrasonic method for non-destructive testing. BSS 15013-84. Plain concrete. Test methods. BSS 505-84. Concrete. 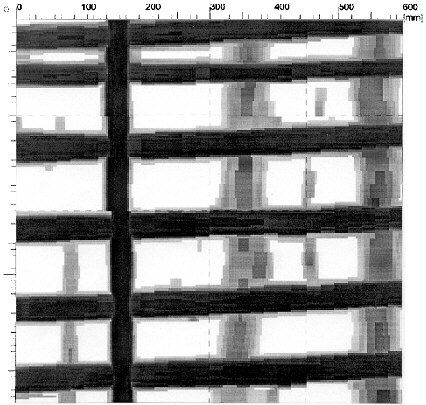 Method of analyzing corroded concrete. BSS 12705-75. Protection of building structures from corrosion. Design norms and rules. BCA No.8, 1980. Hot rolled steel for reinforcing RC structures. BSS 4758-84. Luhzin O. V., E. Pol, et al. 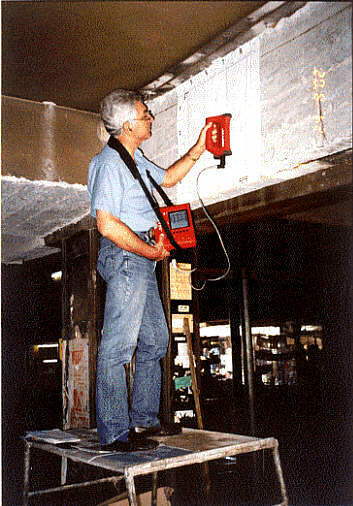 Non-destructive concrete testing. Stroyizdat, 1985. Tetior, A. N. & V. N. Pomeranets. 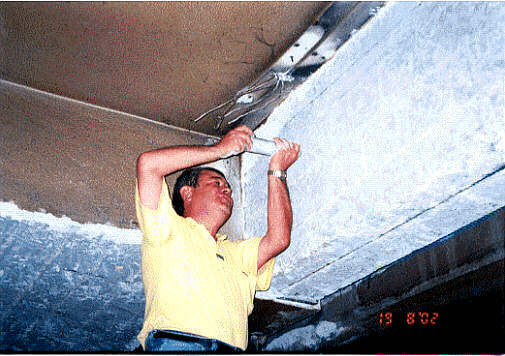 Investigation and Testing of Structures. Kiev, Vysha Shkola, 1988. BS EN 12504-1. Testing concrete in structures-Part 1: Cored specimens - Taking, examining and testing in compression.